In the closing months of the war, the Allies on the Western and Eastern Fronts forced the Germans back towards their homeland. The Luftwaffe, despite dreadful odds, continued to fight with great tenacity. The fighter pilots were mostly young and barely trained, but were led by the few surviving more experienced 'experten' pilots and were often fortunate in the quality of the aircraft they flew. Most numerous and feared by the Allies was Fw190D-9, or 'Dora' as it became known. 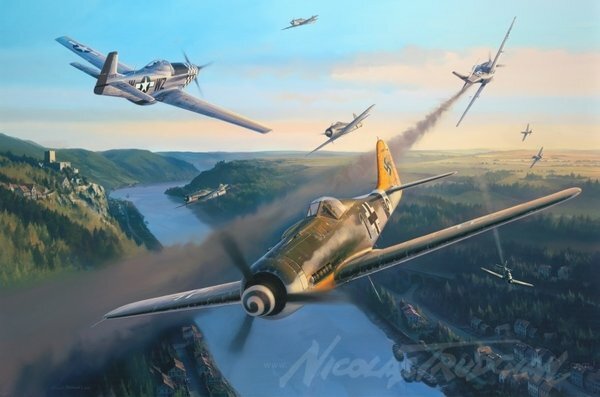 It was more than a match for all Allied fighters including the magnificent P51D Mustang. This fact was pressed home on the 19th March 1945 when Mustangs of the illustrious 78th Fighter Group lost four of their aircraft to the Doras of IV/JG26. The Mustang pilots had been flying a patrol over Germany from their base at Duxford in England and had first encountered Me109K fighters of IV/JG27. In the frenzied dogfight that ensued, the Mustangs downed twelve of the Messerschmitts. However, they then had the misfortune to run into the path of the Doras of JG26 led by the formidable Oberleutant Hans Dortenmann in his distinctive yellow-tailed 'Black 1'. Dortenmann shot down two of the four Mustangs and a further two were also lost before the 78th could make for home. It was a stark reminder of the supremacy of the D-9 and the threat the Luftwaffe still posed. WARRIOR EDITION REMARQUE limited to 10 worldwide Signed by the Artist and two Knight’s Cross holders and one German Cross holder. Hugo Broch KC Erich Rudorffer KCOS Heribert Koller DKiG Each FAST COMPANY limited edition print has a unique original pencil drawing inscribed on it by the Artist, which can be drawn to your own specifications. Drawing size approx. 5" x 2". When placing your order please specify your drawing requirements or whether you would like Nicolas to design it for you. As this is a bespoke order please allow up to 4 weeks before shipping. CANVAS GICLEE EDITION : ROLLED limited to 30 worldwide The only opportunity to obtain the full-size canvas reproduction of this painting, individually signed and numbered in paint by the artist. Size when stretched: 36" x 24". ROLLED Particularly popular for shipping overseas, these canvas giclee prints are supplied rolled and will require stretching onto wooden formers by your picture framer before framing.